Historically, the labour force participation of women under the age of 45 was lower in Quebec than in Ontario. This situation, however, has changed. Since 2003, the labour force participation of women aged 15 to 44 has been higher in Quebec than in Ontario. 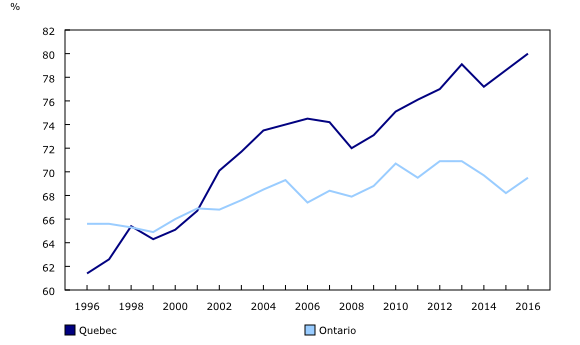 In addition, the fertility rates of women in Quebec are now higher than women in Ontario, after decades of similarity. The findings come from a new study, "Fertility rates and labour force participation among women in Quebec and Ontario." The study examines trends in fertility and labour force participation among women aged 15 to 44 in Quebec and Ontario from 1996 to 2016. In addition to being Canada's two most populous provinces, Quebec and Ontario are demographically similar in a number of ways. For example, they have similar age structures and representation of groups known to have distinctive patterns of fertility and labour force participation, such as Aboriginal people and immigrants. However, these two provinces have followed different paths over the past two decades with regard to parental leave benefits and child care. There are also differences in living arrangements between the two provinces, as more people in Quebec are in a common-law relationship. In 2003, for the first time, the labour market participation of young women in Quebec exceeded that of young women in Ontario. In 2016, 81% of women aged 15 to 44 in Quebec participated in the labour market, compared with 75% of women the same age in Ontario. Most of the increase in the female labour force participation rate in Quebec relative to Ontario occurred among women with young children. From 1996 to 2016, the labour force participation rate of women whose youngest child was under the age of three increased by 19 percentage points in Quebec (from 61% to 80%), compared with 4 percentage points in Ontario (from 66% to 70%). The Quebec–Ontario difference was smaller among women without children under the age of 13 and among older women. Among women over the age of 45, for example, the participation rate increased by about the same amount in Quebec (from 34% to 45%) as it did in Ontario (from 39% to 49%). One theory is that the difference in participation rates between Quebec and Ontario could be related to differences in population characteristics between the two provinces, or to differences in real wage growth over the period. However, the study found that these differences did not explain the divergent trends observed in the labour force participation of women aged 15 to 44 in Quebec and Ontario after 1996. To show the impact of the low-fee child care program in Quebec, the price index for child care and housekeeping services rose by 72% in Ontario from 1996 to 2016, compared with 28% in Quebec. In recent years, young Quebec women not only had higher labour market participation rates than their Ontario counterparts—they also had higher fertility rates. After four decades of similar numbers, fertility rates have been slightly higher in Quebec than in Ontario since 2005. In 2016, Quebec's total fertility rate was 1.59 children per woman, while Ontario's was 1.46. The higher fertility rate in Quebec relative to Ontario is related to the fact that women in their twenties have more children in Quebec than do their demographic counterparts in Ontario. While the fertility rates of women in their twenties have declined in both provinces over the past four decades, the decline was slower in Quebec. Meanwhile, the fertility rates of women in their thirties have increased in both provinces. Provincial disparities in the proportion of women in their twenties who are part of a couple likely explains the higher fertility rates in Quebec. In 2016, 39% of Quebec women in their twenties were part of a couple, compared with 28% of Ontario women. One possible explanation for this difference, underscored in other studies, could be the greater social acceptance of common-law unions in Quebec. Common-law unions are viewed by many as an alternative to marriage which, in turn, facilitates family formation among young adults. In Quebec, 79% of women in their twenties who were part of a couple were in a common-law union in 2016, and 21% were married. In Ontario, women in their twenties who were in a couple were almost equally split between common-law unions and marriage. This study uses data from the Labour Force Survey (LFS), the Census of Population and the Vital Statistics Birth Database. For the purposes of this study, the LFS sample is restricted to women aged 15 to 44, for the years 1996 to 2016, and monthly data are annualized through averaging. Census of Population data from 1996, 2006 and 2016 are used primarily to examine the household living arrangements of women. Fertility data are from the Canadian Vital Statistics Birth Database, an administrative survey that collects demographic information annually from all provincial and territorial registries of live births in Canada. Data for child care and housekeeping services are from the Consumer Price Index. The article "Fertility rates and labour force participation among women in Quebec and Ontario" is now available in Insights on Canadian Society (Catalogue number75-006-X). To enquire about the concepts, methods or data quality of this release, contact Melissa Moyser (613-951-4027; melissa.moyser@canada.ca).